Litigation refers to the rules and practices involved in resolving disputes in the court system. The term is often associated with tort cases, but litigation can come about in all kinds of cases, from contested divorce to eviction proceedings. Disputes and issues often arise between individuals or parties, resolving them are basically called dispute resolution. Dispute lawyers and litigation lawyers are the people who handle problems that arise between two parties or business-related issues that usually need dispute resolution procedures. This is a kind of procedure wherein the parties seek a mediator for help in reaching a settlement. This does not put parties in the trial to negotiate. Because of this, it is less expensive compared to bringing it up in the court. Since each procedure or type has a goal of its own, this one is to have a third-party individual who will be aiding parties to settle into an agreement. A mediator does not urge the parties to take his solution, but a mediator listens to both sides to figure out what really is happening behind the stories. Mediation is a good way to resolve issues since it is not like bringing disputes to trial, which is more expensive and lengthier process. This can cost a lot of time and money for both parties that can lead to let things go out of hands. This is why it is advisable to resolve matters through alternative resolution (ADR) methods, and mediation is an ADR. It takes place outside of court and it can be scheduled whenever both parties are available. Both sides of the dispute are encouraged to be open to the mediator who is assigned to them. This will enable the mediator to find a common ground in which he can use for both to settle on an agreement. The parties are ensured that everything that they will say will be kept confidential by the mediator. This is a procedure wherein an arbitrator settles a dispute. A settlement and decision will not be considered binding unless both parties agreed. There is also a third-party individual who is known as an arbitrator and will serve as a judge. Just like mediation, an arbitrator listens to each party but each one argues and presents their evidence for their rights. There can be a negotiation at the start of the process of what standards of evidence can only be used by them and lawyers are allowed to be present. After listening to both sides, an arbitrator will have its own decision that cannot be appealed. Same as the previous one, this is also less expensive than resolving issues in a court. This is a kind of procedure wherein the dispute is brought in the courts and a judge or jury will decide, based on the evidence that has been presented, a verdict with regard to the case. Two parties are involved in this, and they defend their rights using a dispute lawyer as they go through proceedings. This is considered to be the ultimate way of settling a disagreement between two sides. Dispute resolution law firms are usually called upon in a situation where a dispute has been brought to court. This dispute can be between different parties like individuals, companies, etc. The usual problems that are being resolved in a court are fraud, issues with contracts, business-related disputes, etc. 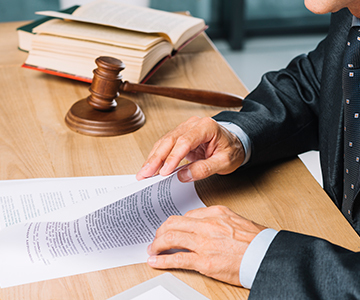 There are a lot of legal matters that come with issues arising between parties, which proves to be why dispute resolution law firms are available to assist in situations like this for support, litigation soliciting and other legal things that need to be done.